Oh, you wanted more pictures of Drift (said no one)?! Well here you go!! And then I switched it up on the sword. And then someone else with a sword showed up. Drift informed him to get off his lawn. itscramtastic wrote: Oh, you wanted more pictures of Drift (said no one)?! carytheone wrote: pics plz... pics or it didn't happen... MOAR PICS! I also like the new sword stickies. itscramtastic wrote: Drift informed him to get off his lawn. Don't have much to say on Drift. Stickers DO look nice. Cobotron wrote: Don't have much to say on Drift. I also wanted MOAR PICS. I got that MP Prowl set! After I got a second MProwl (Takara then Hasbro's) I felt compelled to have a "toy accurate" representation of him. The shoulder cannons and Repro's did a great job of that! The MMC Drift does look pretty sweet, but that MTMTE season 3/Lost Light look is my favorite, though overall he does have some great designs. Hope you kids had a happy new year's celebration, or sleep, whatever you did! TR Slugslinger and Misfire join me today. Maybe pictures later. Who knows. carytheone wrote: I also like the new sword stickies. I think they worked the best. Sad the sword is the wrong size though..
Cobotron wrote: Don't have much to say on Drift. Stickers DO look nice. Did you not like the figure?! I thought it was one of the better designs!! bodrock wrote: I also wanted MOAR PICS. He does indeed look nice. I remember the other day I was all "I NEED MORE DRIFT IN MY LIFE" and today I'm all "Meh, I'm ok with what I have". That said..I still think I need the Q Drift (HE'S A FREAKING RX-7!!) and probably that Ronin. He just looks too nice. shajaki wrote: I got that MP Prowl set! After I got a second MProwl (Takara then Hasbro's) I felt compelled to have a "toy accurate" representation of him. The shoulder cannons and Repro's did a great job of that! I love this set of Repros!! Even though Prowl was "plain" in the cartoon, he looks MUCH better with the labels imo. I should track down some of those shoulder rockets..and a better shape G1 Prowl as the TWO I have from my childhood are destroyed. I don't think I could make a GOOD 50% one!! D-Maximus_Prime wrote: The MMC Drift does look pretty sweet, but that MTMTE season 3/Lost Light look is my favorite, though overall he does have some great designs. I figured MMC would go all out with similar/variants (Wing/Drift/Deadlock) so I'm hoping GCreation does too. 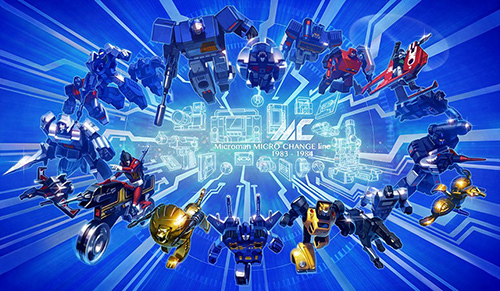 MMC Wing does look good!! I gotta go with Earth alt-modes whenever applicable on most figures for some reason. Then there's others (like my '87 Seekers) that never had them so I'm cool with it. If they DID have an Earth alt I'd probably prefer it. I'm dumb. So as you may know, Christmas was a few weeks ago. Thanks to the Christmas, I acquired things! I may have posted some before..but here's my completed '87 TR Targetmaster Seekers!! And then, using some fundage from the cards of gifts, OVERLORD!!!!! Popped him outta the box and REPRO'D HIM UP!! AND THEN!! I realized I have the SGMF Decepticon Headmaster Juniors!! Those dang Prime Masters keep going in and out of stock on Amazon, I had them in my cart and then they moved out and then I had them again and then they moved out again this morning. My problem is I keep stalling on what to add in (the 3 first wave Prime Masters are "add-on" items)!! DREADWIND will be here today!! The Repros look allsome on Overlord. And who can't get behind how dope those Space Seekers are? Quandary Cram? If you have Amazon Prime, and are working off a GC balance, couldn't you just pull the trigger(happy) on those PMs ASAP? You don't need to pad a shipment for shipping cost or anything, so can't you just shop willy-nilly a la cart? Cobotron wrote: Fantastic stuff! Amazing things! I could, if I wanted to pay double the price buying from another seller on Amazon (but with Prime shipping). Add-On items qualify for purchase and free shipping when they are shipped (including themselves) with product shipped by Amazon to add up to $25+. Add-On items are "Sold and Shipped" by Amazon so I do have to pad the order. Otherwise I could buy them at $10 a piece from another seller on there..but knowing they keep going down to $4.99 if I'm paying attention makes me want to wait!! Lame. That Repro set for Overlord is perfect. I only removed the seam linings on his jet turbines, replaced the post accent on the back of the jet with the larger one from the set, and removed the Decepticon sigil on his shoulder. I'm pumped for Dreadwind, even though he's just a repaint of an Aerialbot that I probably already have from the Liokaiser set! AND I also like MOST of the Liokaiser Repro set!! Still undecided on labeling Dezarus' shuttle mode..I think Skylynx has the labels in question already on! Those 87 Seekers do look good together and somehow all different. I have my trio standing on guard on my TR mostly shelf. They are some cool star ships aren't they? Overlord is looking swish in his new clothes. Fun figure huh? Kick him into base mode and let those Jr's go to town. Dreads is cool and has just enough new to feel fresh and that deco is killer. So you all in for Darkwing Duck? Anyone know if they alt-mode combine? carytheone wrote: Those 87 Seekers do look good together and somehow all different. I have my trio standing on guard on my TR mostly shelf. They are some cool star ships aren't they? They do look awesome, Overlord does too, and I can't wait for Dark(Black)wing!! Yes, they combine!! WING CROSS!! I have yet to put OL into base mode!! Anyone else notice on the instruction sheet that it recommends combining Overlord and Black Shadow's base modes with Trypticon to create "NEMESIS COMMAND"?! HOW AWESOME IS THAT NAME?! itscramtastic wrote: I have yet to put OL into base mode!! I'm hit or miss on the leaders base modes, but OL's is cool. I still think that Soundeave/Blaster has best in class. I'm not much of an instruction reader. I like to figure those things out myself. It's have the fun. I only look if I get parts breakingly stuck and then after the fact to see if I missed any tricks or additional neat things. So I missed Nemesis Command, but that is by far the coolest name ever. Overlord/Black Shadow and Soundwave/Blaster do seem to have the best!! I usually go back to them after playing around to see if there's any fun "official" stuff I missed. I totes missed that! Nice 87 Seeker Squad! Overlord was an awesome figure! My amazon order should come this week Cram! Maybe try HTS for the Prime masters, that's what I did! D-Maximus_Prime wrote: Nice 87 Seeker Squad! Overlord was an awesome figure! Was? Did you shoot him into the void of space then blow him up? I've seen them in droves at our TRU. Like easily 2 maybe 3 cases worth, well at least 5 of each (can't say I know the exact case count). Don't fret wave one is easy to find. But I happen to know someome has amazon funds burning a hole in his spark casing. the Amazon order is the voyagers and the 3 deluxes that aren't Jazz, as he, the legends, and the PM's all came Friday from HTS. Haven't seen a single PotP figure at retail yet. D-Maximus_Prime wrote: Haven't seen a single PotP figure at retail yet. Distribution is so rando. I got the dinos (skipped Jazz, cause I don't need another, couldn't pull the trigger on Dreadwind, but got him for Xmas) and legends from a local Target a week in between (the same one as they never showed at our other Target). I saw the PMs, deluxes and voyagers at TRU last week. I hear the leaders are hitting Walmarts around the country. Haven't seen any or heard any reports from the local collectors in my area. I'd like to hold a leader in box but I have no intention of getting any at list price. They look fun, but have no home in my collection. What do you mean blew him up?! HE'S AMAZING!! The rest of my Amazon ordered PotP figures will be here today!! Dreadwind came in yesterday. Awesome awesome awesome!! I also have yet to see them at the one store I went to that never gets anything. I'll check another store this weekend!! If you didn't know, I picked up Reprolabels while they were on sale. You saw the awesomeness of Overlord. Here's some of the awesomeness of Liokaiser!! It's really mainly highlights. I'd have to bring the rest in (which I may) to show off what's new. I have enough Liokaiser team pics that I could do comparisons! I think I kept the ones for the wings of Dezarus, Hellbat, and Guyhawk off as they were painted anyway. I did add tailfin accents if they had them, and some areas of the torso and such on all mainly in the combiner port section. I also want to compare factory Skylynx to see what Dezarus is missing to possibly put the window stickers on in shuttle mode. I mentioned Dreadwind earlier. Here he is with additional Amazon haul stuff!! And here he is with other jets that would be in the "Air Raid" line!! And here he is with some of his Super God Masterforce cohorts!! All the things and the stuff! carytheone wrote: All the things and the stuff! I forgot to mention it earlier, but that's part of the reason I've been excited for these guys!! So dang late '80's early '90's I love it. The only thing they are missing is "hypercolor". I feel like there were some bots that changed color?! Maybe I'm imagining it..you know, like the Hot Wheels that changed color with warm or cool water. So much fun. Such toxic paint. So what's up monkey fighters? Had a crazy week. Super busy and such. Here's a breakdown of deskbots..
Lightfoot and Ginrai, because those names fit the far better versions of these characters!! Totes need new labels for these guys. 4/5 year old me didn't do so hot on the sticker placement Fun fact, Lightfoot is a Mazda FC3S (3rd gen RX-7) racecar! They shoulda made the RX-8 Mazdaspeed Alternator into him..woulda been noice!! SGMF is my jam. And I needs that Magnus Prime to face off against Overlord. 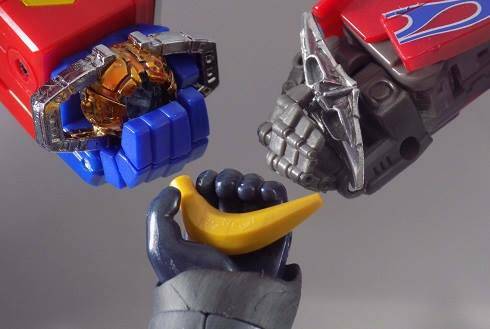 Along with the PE Ginrai/Transtector figures. This guy is sharp. I couldn't remember what to do with his arms and then I noticed pegs in what would be the underside of the rear window glass. Forearms peg in, back half closes down, all weapons/accessories stored. So he does that just better enough than MP Wheeljack I still think he's too short. I wouldn't mind a CW Wheeljack to compare him to. What I REALLY wouldn't mind is G1/Action Master/Generations/MP/CW to compare. Wheeljack is that DUDE!! Wow. That alt mode is amazing. I'm sad to see him go, but all I like him for is the alt mode, and I'd rather have the MP alt mode-ing it up. 4,481 pages were recently viewed by 723 unique visitors. This page was viewed 1 times on Thursday, April 25th 2019 11:21am CDT. © 2019 Seibertron, Inc. DBA Seibertron.com. All Rights Reserved. Established June 2000. Seibertron.com is owned by Ryan Yzquierdo.